The traction grade assigned to this tire is based on straight-ahead braking traction tests, and does not include acceleration, cornering, hydroplaning or peak traction characteristics. The traction grades, from highest to lowest are AA, A, B, and C.
The grades represent the tire’s ability to stop on wet pavement as measured under controlled conditions on specified government test surfaces of asphalt and concrete. A tire marked C may have poor traction performance. A label showing the OE (Original Equipment) tire sizes, recommended inflation pressure and the maximum weight the vehicle can carry. A number on the sidewall of each tire providing information about the tire brand and manufacturing plant, tire size and date of manufacture. Also referred to as DOT code. A class of P-metric or Metric tires designed to carry a maximum load at 35 psi [37 psi (2.5 bar) for Metric tires]. Increasing the inflation pressure beyond this pressure will not increase the tire’s load-carrying capability. A class of P-metric or Metric tires designed to carry a heavier maximum load at 41 psi [43 psi (2.9 bar) for Metric tires]. Kilopascal, a metric unit of air pressure. Pounds per square inch, a standard unit of air pressure. The tire pressure when the vehicle has been stationary and out of direct sunlight for an hour or more and prior to the vehicle being driven for 1 mile (1.6 kilometers). The cold inflation pressure found on the Safety Compliance Certification Label (affixed to either the door hinge pillar, door-latch post, or the door edge that meets the door-latch post, next to the driver’s seating position) or Tire Label located on the B-Pillar or the edge of the driver’s door. The structural member at the side of the vehicle behind the front door. : Area between the bead area and the tread. Area of the perimeter of the tire that contacts the road when mounted on the vehicle. The metal support (wheel) for a tire or a tire and tube assembly upon which the tire beads are seated. Both U.S. and Canada Federal regulations require tire manufacturers to place standardized information on the sidewall of all tires. This information identifies and describes the fundamental characteristics of the tire and also provides a U.S. 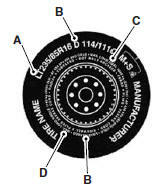 DOT Tire Identification Number for safety standard certification and in case of a recall. A. P: Indicates a tire, designated by the Tire and Rim Association, that may be used for service on cars, sport utility vehicles, minivans and light trucks. 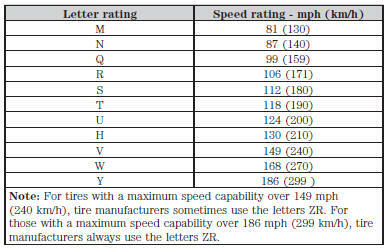 Note: If your tire size does not begin with a letter, this may mean it is designated by either the European Tire and Rim Technical Organization or the Japan Tire Manufacturing Association. B. 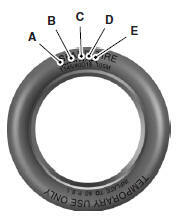 215: Indicates the nominal width of the tire in millimeters from sidewall edge to sidewall edge. In general, the larger the number, the wider the tire. C. 65: Indicates the aspect ratio which gives the tire’s ratio of height to width. D. R: Indicates a radial type tire. E. 15: Indicates the wheel or rim diameter in inches. If you change your wheel size, you will have to purchase new tires to match the new wheel diameter. F. 95: Indicates the tire’s load index. It is an index that relates to how much weight a tire can carry. You may find this information in your owner’s manual. If not, contact a local tire dealer. Note: You may not find this information on all tires because it is not required by federal law. G. H: Indicates the tire’s speed rating. The speed rating denotes the speed at which a tire is designed to be driven for extended periods of time under a standard condition of load and inflation pressure. The tires on your vehicle may operate at different conditions for load and inflation pressure. These speed ratings may need to be adjusted for the difference in conditions. The ratings range from 81 mph (130 km/h) to 186 mph (299 km/h). These ratings are listed in the following chart. H. U.S. DOT Tire Identification Number (TIN): This begins with the letters DOT and indicates that the tire meets all federal standards. The next two numbers or letters are the plant code designating where it was manufactured, the next two are the tire size code and the last four numbers represent the week and year the tire was built. For example, the numbers 317 mean the 31st week of 1997. After 2000 the numbers go to four digits. For example, 2501 means the 25th week of 2001. The numbers in between are identification codes used for traceability. This information is used to contact customers if a tire defect requires a recall. J. Tire Ply Composition and Material Used: Indicates the number of plies or the number of layers of rubber-coated fabric in the tire tread and sidewall. Tire manufacturers also must indicate the ply materials in the tire and the sidewall, which include steel, nylon, polyester, and others. K. Maximum Load: Indicates the maximum load in kilograms and pounds that can be carried by the tire. See the Safety Compliance Certification Label (affixed to either the door hinge pillar, door-latch post, or the door edge that meets the door-latch post, next to the driver’s seating position), for the correct tire pressure for your vehicle. • Treadwear: The treadwear grade is a comparative rating based on the wear rate of the tire when tested under controlled conditions on a specified government test course. For example, a tire graded 150 would wear one and one-half (11⁄2) times as well on the government course as a tire graded 100. • Traction: The traction grades, from highest to lowest, are AA, A, B, and C. The grades represent the tire’s ability to stop on wet pavement as measured under controlled conditions on specified government test surfaces of asphalt and concrete. A tire marked C may have poor traction performance. • Temperature: The temperature grades are A (the highest), B and C, representing the tire’s resistance to the generation of heat and its ability to dissipate heat when tested under controlled conditions on a specified indoor laboratory test wheel. M. Maximum Inflation Pressure: Indicates the tire manufacturer’s maximum permissible pressure or the pressure at which the maximum load can be carried by the tire. This pressure is normally higher than the vehicle manufacturer’s recommended cold inflation pressure, which can be found on the Safety Compliance Certification Label (affixed to either the door hinge pillar, door-latch post, or the door edge that meets the door-latch post, next to the driver’s seating position), or Tire Label which is located on the B-Pillar or the edge of the driver’s door. The cold inflation pressure should never be set lower than the recommended pressure on the vehicle label. The tire suppliers may have additional markings, notes or warnings, such as standard load or radial tubeless. LT type tires have some additional information beyond those of P type tires. These differences are described below. Note: Tire Quality Grades do not apply to this type of tire. 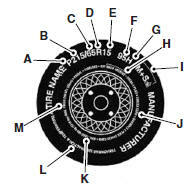 A. LT: Indicates a tire, designated by the Tire and Rim Association, that is intended for service on light trucks. B. Load Range/Load Inflation Limits: Indicates the tire’s load-carrying capabilities and its inflation limits. C. Maximum Load Dual lb (kg) at psi (kPa) cold: Indicates the maximum load and tire pressure when the tire is used as a dual, defined as four tires on the rear axle (a total of six or more tires on the vehicle). D. Maximum Load Single lb (kg) at psi (kPa) cold: Indicates the maximum load and tire pressure when the tire is used as a single, defined as two tires (total) on the rear axle. T type tires have some additional information beyond those of P type tires. These differences are described below. T145/80D16 is an example of a tire size. Note: The temporary tire size for your vehicle may be different from this example. Tire Quality Grades do not apply to this type of tire. A. T: Indicates a type of tire, designated by the Tire and Rim Association, that is intended for temporary service on cars, sport-utility vehicles, minivans and light trucks. B. 145: Indicates the nominal width of the tire in millimeters from sidewall edge to sidewall edge. In general, the larger the number, the wider the tire. C. 80: Indicates the aspect ratio, which gives the tire’s ratio of height to width. Numbers of 70 or lower indicate a short sidewall. D. D: Indicates a diagonal type tire. R: Indicates a radial type tire. E. 16: Indicates the wheel or rim diameter in inches. If you change your wheel size, you will have to purchase new tires to match the new wheel diameter. You will find a Tire Label containing tire inflation pressure by tire size and other important information located on the B-Pillar or the edge of the driver’s door. See the payload description and graphic in the Load Carrying chapter.